Who said that? It’s definitely someone in content marketing, web strategy or digital communications, right? Don’t we all feel that way? Every day our jobs are getting ahead of us, instead of us getting ahead of our jobs. It may surprise you that the above quote is from Atul Gawande, MD, who wrote a supremely useful and convincing book called The Checklist Manifesto: How to Get Things Right. Gawande is a general surgeon who suggests that applying simple checklists to both complicated and routine medical procedures can affect overall success rates and reduce infection and mortality. What does this have to do with content marketing? A lot. As I always say, “Great content strategy is about taking the guesswork out of execution, so creativity about content can flourish.” To help get all of the execution details straight, I’ve developed the Creating Valuable Content Checklist™. UPDATE: You can now download the Creating Valuable Content Checklist in German. For examples of stellar content creation, download CMI’s eBook, 75 Examples to Spark Your Content Marketing Creativity. Hat tip to Colleen Jones who inspired some of these benchmarks. Today I’m going to share some quick tips on how to use the checklist, and then I’ll break down each of the elements tomorrow. 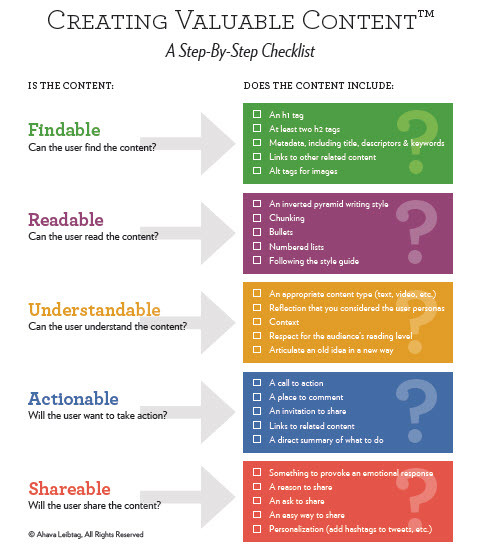 Download the Creating Valuable Content Checklist™ [PDF]. Before you start using this checklist, it’s important to understand how to use it. The first thing is to get the right people involved. One of the most persuasive stories Gawande tells is about how some of the most run-down hospitals in Detroit instituted a checklist for inserting a central line. Hospitals use central lines, which are injection ports, to minimize the number of needle sticks. However, these lines can often become infected. To reduce the probability of infection, a doctor named Provonost created a central line checklist and persuaded some hospitals in Detroit to participate in a study to see if the checklist was effective. Each hospital that participated in this project assigned a senior project manager, as well as an executive who would visit at least once a month, hear the staff’s complaints, and help them solve problems. Why did the executive need to be involved in something considered tactical? Some of the staff’s issues were things that only the executives could solve, such as supplying the right kind of antiseptic soap and proper size drapes. By capturing the attention and action of the executives, these hospitals in Detroit brought down central line infections by 66%. In content marketing, your executives may be the people who can effect change in your resources or influence your company’s policy towards things like social media or the overall “voice” of your brand. By educating your key executive about the content marketing challenges facing your team and proposing solutions, you have a real opportunity to make a difference. Maybe you can increase traffic to your site by 66%. The point is, that by methodically moving down the basic details you need to attend to with every project with your decision makers, you may be able to solve problems more easily than you realized. Over the years I’ve developed my own internal checklist of what needs to happen to keep the user interested in what I was writing. But I’ve also known that I control only part of the process. Visual design, information architecture, and usability combine to create user experience and are key in keeping users on pages. To implement the checklist properly, you need to get all the members of the digital strategy team working through the checklist together and make changes as needed. They may even have their own checklists, so combine them for maximized effectiveness. I hope you will print it out and use it often. And if you would like to learn more, check out the next post, in which I look at each of these benchmarks in more detail to help you understand what each point means and what you can do to make your content more valuable. Please consider leaving a comment about the checklist—do you think there are things you would add for your organization? Do you use something similar? If so, does it work as effectively as promised above? Looking to score big points with your target audience? CMI’s 2016 Content Marketing Playbook has tips, insights, and ideas that can help increase your success with 24 of the top content marketing tactics. Based in the Washington, D.C. metropolitan area, Ahava Leibtag is a Web content strategist and writer. She leads AHA Media Group, a Web and content consulting firm, and authors the blog Online it ALL Matters. She thinks 60 words is way too few to communicate why she’s interesting. You can connect with Ahava on Twitter at @ahaval.